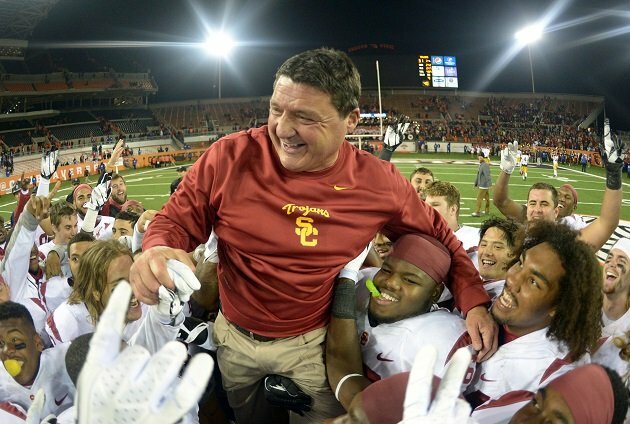 Real Talk From Lia: As much as I like to joke around, I just want to say that I honestly have been a very big fan of Ed Orgeron ever since he stepped up as USC’s football coach. His fun, refreshingly positive, classy leadership style and his genuine affection for the players is something I admired a lot more than winning, but he did a lot of that, too. It felt really good to cheer for him and the team, and yesterday’s news of his leaving made me very sad. I’ve really enjoyed writing about Coach O on LeahAndLia.com before, and I wanted to do it again as my little tribute. If somehow he magically reads this (one can dream!) I’d like to say thank you for a special season. Letting go of a special sports coach you really loved can be complex whether you’re an athlete or a fan. That’s because the departure of a beloved team leader is like experiencing a death—excuse me… Death Eater instructing a Dementor to kiss away your happiness. He just got the news on ESPN. Even if your own athletic director is the one who initiated the breakup because he thinks it’s the right thing to do, letting go of your favorite coach follows the same process as mourning… some other deal that makes you real sad. In this phase our heart rather than our head rules our belief system as we try to adjust to the idea of games without the coach we’re losing. Even though we know the coach is gone, we don’t really believe it. Contrary to what all of our concerned friends who are looking at us kind of funny are saying, we can’t help but entertain fantasies that somehow our favorite coach will come back if we show up on his lawn armed with a boombox and Peter Gabriel. We see hidden glimmers of hope buried in glaring LA-Times-headline-type-signs that it’s over. It’s true, this is the phase where we are most tempted to engage in late night texting; not with the coach but with friends that are desperately trying to figure out why we keep calling them coach. Anger appears in a lot of forms: anger at the coach (“How could he leave? After he said he LOVED ME—I mean US! US. ), anger at a higher power or the universe (“Why can’t our team’s coaches ever work out? Why?? ?”), anger at people or situations associated with the breakup (anger at the replacement coach; anger at the athletic director; anger that the team lost to your rival school, because that’s when everything “changed”), and anger at other people who don’t agree or stand with your anger (“Can you believe the media is just moving on like it’s nothing??”). This is the phase where we think it’s a fine idea to tell anyone and everyone that this is the worst thing ever. This is also when we think it’s important to send the athletic director heated emails and tweets because we don’t want him thinking he got away with anything. Bargaining frequently is closely linked with denial. Bargaining can be searching for any – literally any – way to bring your coach back through negotiation, threats, and/or magic—for example, telling your athletic director that you will change (into a magician), or quit school (to learn magic) or go to more weekenders. You might tell him he is hurting the fans, his family, your family, and the big, white horse by letting the coach leave. This phase is not only limited to bargaining with your athletic director. Many people bargain with The Powers That Be, promising to be a better football player or fan if only the coach will come back. During this stage, you may take a new interest in astrology, tarot cards, sports writing, or any other type of voodoo that will forecast a reunion. This is also when we try to get top players and alumni to help “talk some sense” into him. Hopelessness, like anger, also comes in many different forms, for example not wanting to do anything but lay in bed, feeling disconnected from people even when you’re with them on Facebook Chat, being on the verge of tears most of the time, loss of appetite for bacon-wrapped hot dogs or eating too many bacon-wrapped hot dogs, and an increase in deep sighing, and (the big one) giving up on the sport. Giving up makes it feel like your team will never make you happy, or that you will never enjoy watching your team beat UCLA again (you will, that’s just the hopelessness talking). Finally, this is the phase in which we are able to make peace with the loss. It often comes on gradually, little by little, sprinkled in with some of the other phases. Acceptance doesn’t always involve sunshine and dancing—there is almost guaranteed to be lingering sadness. Acceptance involves slowly moving forward. Sometimes it feels like this phase will never come, which usually means you’re still stuck in an earlier “openly weeping in the shower” phase. Knowing your phases of grief can help normalize your coach resignation experience. It’s also important to know that there are no time limits and there is no rushing the process. Grieving is like the time clock in a game: there is nothing you can do to make it go faster. Other than calling occasional timeouts or flagrant cheating, the only thing you can do with the clock is wait it out. But take comfort that this, like everything else, will eventually pass. You will start to look forward and actually plan tailgates for the future. Eventually, you will be able to think about your favorite coach without pain; nostalgia, yes, but the sadness will be gone, because he’s still like, super wonderful and in a better place (i.e. some school that jumps at the chance to fulfill his well-deserved dream and hire him as head coach). You will once again anticipate September, and yes, even find joy in the experience of cheering on your team. *Just a totally random example off the top of my head. **Even more random arbitrary example. Tags: anger, athletic director, bargaining, Coach O, coaching, college, College football, Ed Orgeron, facebook chat, football, grief, grief loss and bereavement, grieving, health, LA-times, powers that be, sports coach, UCLA, USC. Bookmark the permalink.